Well... 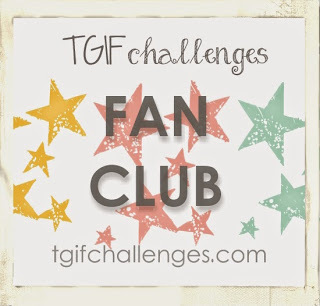 I'm at it again with another TGIF Challenge! Only this one is... extremely different! 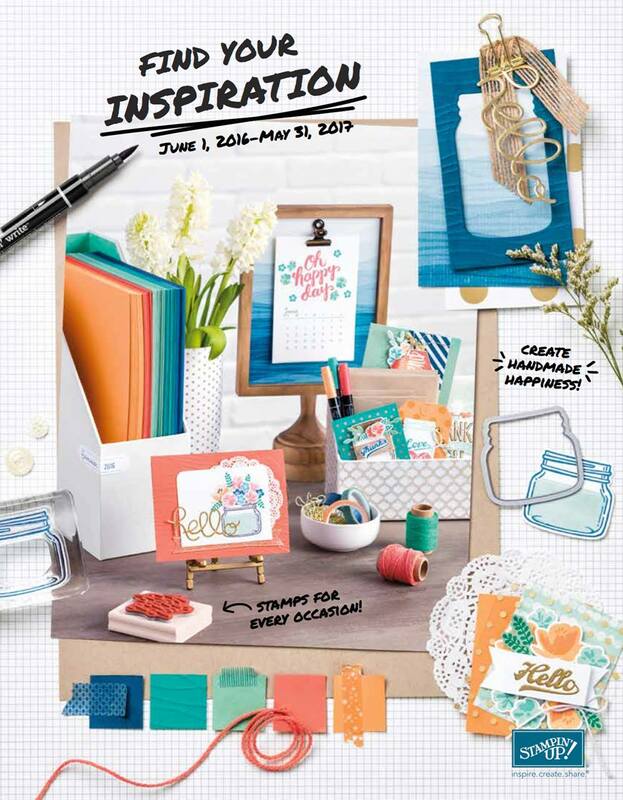 If you're looking for a nice, relaxing challenge to inspire your creativity, then this may not be for you. But if you're like me and love a good challenge, then you should really check out the monthly Throw-down challenges. They're crazy! Okay, so what is a Throw-down Challenge? Well the premise is very similar to a cooking show on the food network called "Chopped". Each month you are given a "basket" of items to create with. The items will be challenging and may not quite go together, but that's the challenge! You do not need to use every item from the basket, but you must use the minimum stated by the challenge. 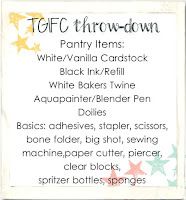 Along with your basket, there is also a "Pantry" list of basic tools and paper crafting supplies. Basically... imagine that you grabbed ONLY the listed items, walked out of your craft room and locked the door. 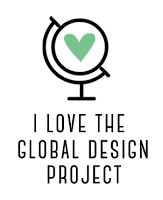 Now look down at what you're holding...That's ALL you can use to create your project! I told you it was crazy! 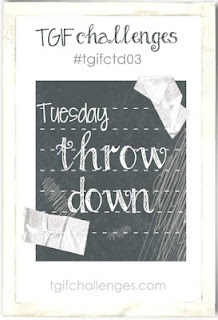 Okay so let's check out this month's throw-down challenge! This month's challenge states that we need to use at least 4 items from the basket. Also, whenever it states "OR" you must chose one or the other, but not both. 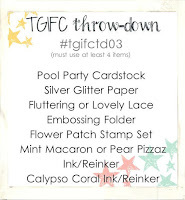 So I used: Pool Party Cardstock, Silver Glitter Paper, Flower Patch Stamp Set, Mint Macaron Ink and Calypso Coral Ink. I didn't have either embossing folders and there are no substituations in this "game". From the pantry I used: Whipser White Cardstock, White Baker's Twine, Doilies, Adhesive, Bone folder, paper cutter and clear blocks. So, what do you think? Yay or Nay? Did I succeed at the challenge? I'm pretty happy with it, especially since I was a little skeptical. I must admit though, that I really missed my tools and go-to items... Can we say rhinestones!?! Also, the co-ordinating framelits were not in the basket, so... yup, fussy cutting it was! 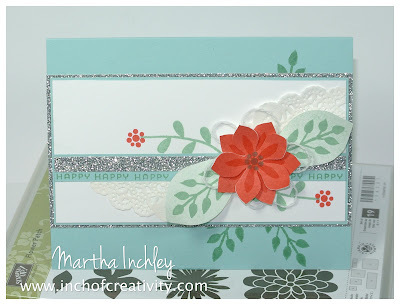 My Flower is 2 stamp layers of full strength Calypso Coral ink. 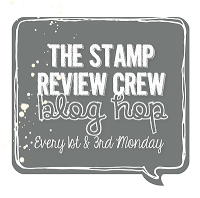 The leaf is 2nd generation stamping, layered with full strength Mint Macaron Ink. I stamped Mint Macron in the center of my flower. I also stamped Mint Macaron onto my Pool Party Cardstock. Well, Thanks for stopping in! 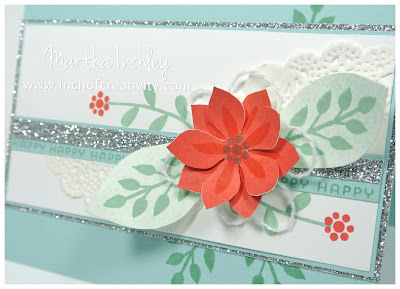 Make sure to hop on over to the TGIF Challenges Blog to see other throw-down #3 entries and Happy Creating, as always! sounds confusing, but the card doesn't look like that; the card is beautiful! 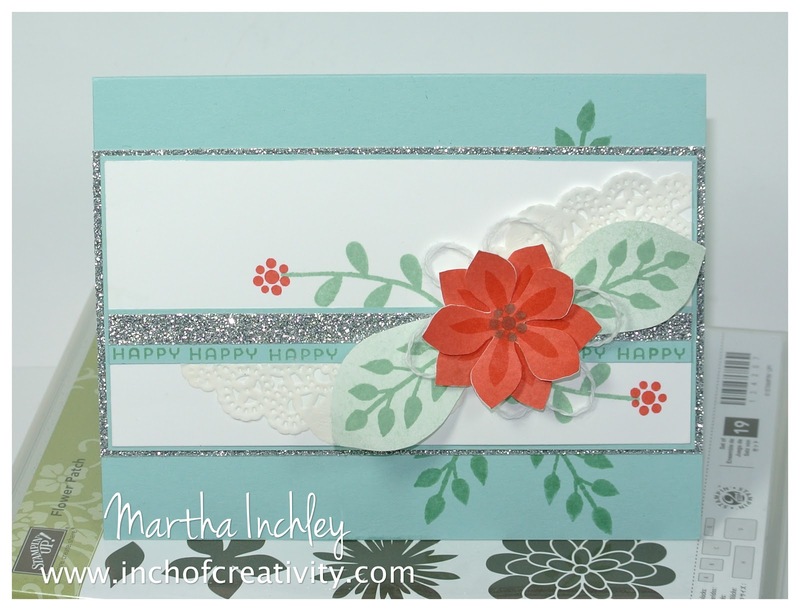 Gorgeous card Martha! I love how you layered the elements and the highlights of sparkle from the glitter paper.